This section describes the procedures to be followed for the development of The Open Group Standards. It includes the Core Processes, together with Supporting Processes. Any standard represented by an entry in the Standards Information Base (SIB) represents consensus among the members of The Open Group that the definition is broadly adopted and suitable for use in the definition of Enterprise Architectures, in procurement of products, and in the identification of operational best practices in specific areas of IT. When a document is approved as a standard of The Open Group, an entry is added to the Standards Information Base. The Open Group Standards are published by The Open Group (or by a third party under The Open Group logo). The Open Group Referenced Standards are those published by a third party. The Core Processes run from agreement on an idea to develop a standard, draft development, review, approval, and publication of the standard. The Open Group Manager is responsible for the execution of the Company Review Process. The Forum or Work Group is responsible for the resolution of comments and issues arising during the Company Review Process. On successful completion of the Company Review Process, The Open Group Manager is responsible for preparing a proposal for approval by The Open Group Governing Board through the Approval Process. After approval, the Technical Editor will manage the Publication Process. The decision to add the development of a new standard to a Forum or Work Group work program should be a consensus decision of the applicable Forum or Work Group. The process of producing draft text is decided by the Forum or Work Group in co-operation with The Open Group Manager and Technical Editor. The starting point is usually one of a number of document templates available from The Open Group Specification Tools Area. The decision to move a draft text into the formal Company Review Process should be taken using the Consensus Decision-Making Process within the applicable Forum or Work Group. The Company Review Process is the formal process by which The Open Group measures consensus around a document in order to become a standard of The Open Group. Prior to commencing a Company Review the document must pass the pre-Review approval process documented in the Pre-Review Approval Process. The Company Review Process may also be applied to achieve consensus on documents that are not standards; e.g., Guides, White Papers, and Business Scenarios. For companies and organizations not participating in the Work Group (if any). There is only one (1) vote per company and/or organization. Where appropriate, The Open Group Governing Board, Forum, and/or Work Group may independently agree to extend the Review Group to include other individuals and/or organizations as Invited Experts. The invitation to participate shall be issued by the appropriate The Open Group Manager, who shall ensure that any appropriate non-disclosure agreements are in place. Both reviewers and balloters may participate in the review and may raise Change Requests. All Change Requests must be considered, but only balloters vote on the acceptance/disposition of Change Requests. The Open Group Manager is responsible for ensuring that the document is available. All documents submitted for Company Review shall be distributed electronically. Copies of the document shall normally be placed on The Open Group web server, and availability announced by email to all reviewers and balloters, at least seven (7) days before the formal start of the review period. In all cases, the document must be available before the start of the review period. The document to be reviewed must be made available in acceptable web format, and shall be formatted to be printable on both A4 and US letter (i.e., maximum area 8" x 11", 200 x 275mm). Wherever possible, page and line numbering should be applied and consistent across all delivered formats. When using The Open Group Document Online Review System for an online web document review, instead of page and line numbers, tag numbers are inserted within the web document. The Company Review period shall be proposed by The Open Group Manager and shall be geared to the nature of the document. The Open Group Governing Board may by resolution impose a different duration. For an initial review of a Draft Standard containing content other than certification-related materials, the review period shall normally be four (4) weeks. For Recirculation Reviews, the review period shall normally be two (2) weeks. For documents other than standards, the review period shall be defined by The Open Group Manager, and be no less than two (2) weeks. Any shorter review period shall normally only apply to minor changes and is subject to resolution of The Open Group Governing Board. During the Review, the Change Request Process will be implemented. See Change Request Process. The Company Review focuses primarily on technical matters, which specifically includes agreement on the technical content of the document and the definition of parts which are considered mandatory for certification purposes. During Company Review, The Open Group editorial team may submit additional comments to ensure consistency of style and presentation of documents across the complete range of The Open Group publications. If as a result of the Change Request Process carried out during the Company Review the number of changes arising from a Company Review is large, one or more of the balloting members of the Review Group may request of The Open Group Manager that the revised document be circulated for a repeat review. If The Open Group Manager does not accede to this request, this shall be reported to The Open Group Governing Board as part of the Company Review Report described above. The revised document shall annotate all changes made. The formal notice period required for the review is two (2) weeks. The standard review period is two (2) weeks. Objections are restricted to unresolved issues remaining from the previous review cycle and any changes introduced since the previous review round (or the impact of such changes elsewhere in the document). There is no limit to the number of Company Review cycles. However, The Open Group Governing Board may resolve not to continue the review if it appears that consensus cannot be achieved in a timely manner. At the conclusion of the Company Review, the Technical Editor will then implement the agreed Change Requests. Upon completion of technical editing the final proof of the standard will be made available to allow for confirmation that the technical integrity of the document has not been compromised during the editing process. At least one (1) week's notice will be given to all balloters by email of the start of the final proofcheck. The document will be made available via The Open Group web server. A two (2)-week period will be allowed for the review. Comments, which must be restricted to the incorrect application of agreed Change Requests, must be submitted to the responsible The Open Group Manager, and circulated to the mailing list(s) used for the review. A Company Review Report showing how comments and objections arising during the review have been addressed, and including the outcome of other necessary reviews. A statement confirming that the Standards Adoption Criteria have been satisfied. Resolutions to approve a Draft Standard shall be notified to The Open Group Governing Board via The Open Group Legal Counsel by email, and copied to The Open Group Director, Standards. The proposal shall be considered by The Open Group Governing Board at the next appropriate meeting or by email between meetings. If any member of The Open Group Governing Board believes that there has been a failure to adhere to the approved Standards Process, they shall bring that to the attention of The Open Group Legal Counsel within two (2) weeks, in which case the matter will be referred to a meeting or teleconference of the Governing Board, and the Draft Standard shall not proceed until the matter is resolved. The formal approval of specifications as standards by The Open group Governing Board is primarily a check on the integrity of process not of content. Governing Board members owe a duty to The Open Group to act in its best interests and to protect its assets. If a Governing Board member believes that approval of a standard is contrary to this duty, he/she may vote against. All decisions not to publish a standard which has successfully completed Company Review shall be reported to The Open Group Governing Board. The following processes support the Core Processes or are variants on a Core Process. 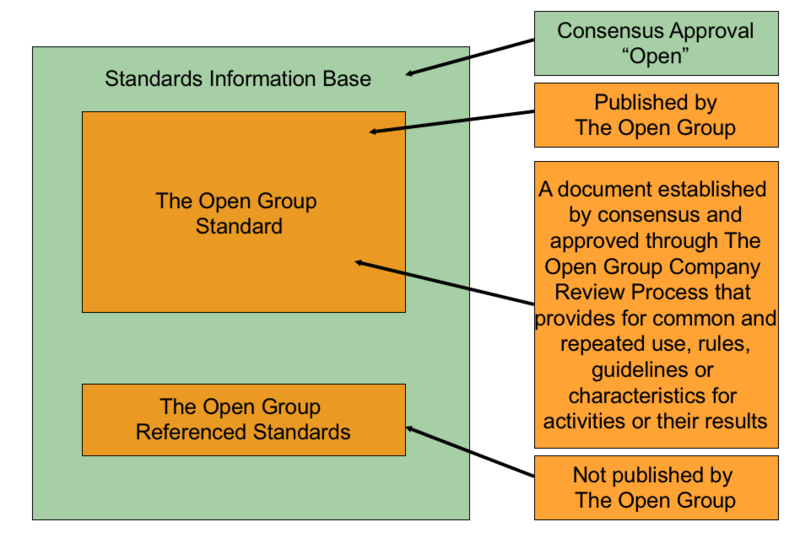 In order to become a standard of The Open Group Standard a document must achieve Consensus within The Open Group membership. This means that the Consensus Decision-Making Process is used when developing documents set to become standards of The Open Group Standards. Consensus is a principle of The Open Group. 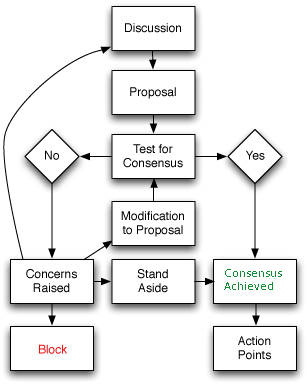 To promote consensus, The Open Group Standards Process requires Chairs to ensure that Forums and Work Groups consider all legitimate views and objections, and endeavor to resolve them, whether these views and objections are expressed by the active participants or by others (e.g., another Forum or Work Group, or a group in another organization). Decisions may be made during meetings (face-to-face or distributed) as well as through email. Consensus must be established over a time period sufficient to give any interested party an equal chance to participate. By default, the set of members eligible to participate in a decision is the set of Forum or Work Group members. The Standards Process does not require a quorum for decisions. Instead, the call for consensus is sent to all members eligible to participate. Where unanimity is not possible, a Forum or Work Group is recommended to make consensus decisions where there is significant support and few abstentions. The Standards Process does not require a particular percentage of eligible members to agree to a motion in order for a decision to be made but there must be sufficient evidence to demonstrate the consensus. The Consensus Decision-Making Process is applied at all stages during the development of a Draft Standard. A separate Handbook is available providing detailed guidance. In the case of a blocking situation arising, the Unanimity minus two (or U-2) process should be invoked by The Open Group Manager. Proposed changes to a document under review should use the Change Request Process. All requests for modifications must be the subject of formal Change Requests and shall be submitted during the Company Review either by email sent to the notified email address or The Open Group Document Online Review System, whichever is applicable for the review. To which document the Change Request refers. A unique reference, including company name or an appropriate abbreviation thereof, which may be used to refer to the Change Request. The reference should include a sequence number to enable The Open Group Manager (and others) to identify any Change Requests not delivered by email. Name of the company submitting the request. Reason that change is needed, reason that the suggested change is preferred over other possibilities, etc. Specific changes which should be made to the document to satisfy the objections. Sufficient information must be included to uniquely identify the location affected, including page, section, and line numbers, when available. In the case of pervasive changes, individual changes may not be feasible. In such cases, other methods to describe the changes are permitted, but must define completely the action required of the editor. However, it should be noted that such changes may be difficult to discuss at such a late stage of the specification life-cycle. Accept: accept the proposed change from the submitter "as is"
The Open Group Manager shall compile and circulate to the Review Group a list of all Change Requests received and the Sponsor's proposed resolution (if any), together with a ballot form, making it absolutely clear whether it is the original Change Request or Sponsor's proposed resolution that is the subject of the ballot. Balloters shall vote by email on every original Change Request or Sponsor's proposed resolution, as applicable, within a reasonable period prescribed by The Open Group Manager (no less than one (1) week). Their votes must be Yes (accept), No (reject), or Abstain (don't care). Only Yes and No votes shall be counted when deciding the result of the ballot. It is acceptable for The Open Group Manager to include an option on the ballot form for balloters to indicate their acceptance of all the original Change Requests or Sponsor's proposed resolutions, as applicable to the review. The votes will be counted by The Open Group Manager and the results normally circulated within one (1) week after the end of the ballot period. There are no quorum requirements for Company Review ballots. Where a Change Request is clearly accepted, the Change Request is to be applied to the document under review with no discussion; where a Change Request is clearly rejected, it is discarded with no discussion. Where a proposed resolution for a Change Request is clearly accepted, the proposed resolution is to be applied to the document under review with no discussion. Where a Change Request or proposed resolution is unresolved, reasonable effort will be made to achieve resolution through a discussion prior to and at an issue resolution meeting. This is under the lead of The Open Group Manager. Prior to seeking approval to release a document under the Snapshot Process the document must pass the Pre-Review Approval Process documented in Section 3.3.8. A Snapshot publication (see Snapshot) is released with no Company Review or formal approval status. The Approval Process is working body consensus to release as a Snapshot together with a recommendation from The Open Group Manager and The Open Group Executive Management review and approval. A Snapshot usually has a lifetime of no more than six (6) months before being withdrawn. The development, review, and approval process for a Preliminary Standard (see Preliminary Standard) is the same as for a full standard of The Open Group. The Fast Track Process is a variant of the Company Review Process applied when a specification is brought forward by a Platinum member (the Sponsor). The process commences with the Sponsor informing The Open Group Executive Management of its intent to submit a proposal for Company Review of a Candidate Specification. The Sponsor must be prepared to undertake the circulation and subsequent editing of documents, and supply written confirmation of willingness to comply with The Open Group commercial and legal conditions (as defined in the Standards Adoption Criteria). After consulting with any relevant Forum(s), Work Group(s), and if applicable The Open Group Governing Board, The Open Group Executive Management will indicate its willingness to accept the submission into the Fast Track Process. This decision will take into account stated priorities of customers and vendors and the availability of resources. The Open Group Executive Management must inform the Governing Board of any Company Review submissions that it rejects from consideration, including the rationale for rejection, unless the submitters expressly request to maintain their confidentiality. At this stage The Open Group Executive Management appoints an individual, The Open Group Manager, to manage the process and be responsible for the correct execution of the Company Review. At this stage, the submitter must make the document available. The submitter may either deliver the document to The Open Group for electronic distribution, or provide a pointer to the location of an electronic version of the document in a manner acceptable to The Open Group Manager. If there is any significant delay compared to the original plan, the Governing Board may resolve that the Company Review has failed. If the specification falls within the scope of a Forum or Work Group, that group forms the Ballot Group; otherwise, The Open Group Governing Board appoints the Ballot Group. The submitting organization is responsible for the resolution of Change Requests arising during the Company Review. If the ballot or issue resolution results in rejection of any recommendation made by the Sponsor, the Sponsor has the right to withdraw the proposed standard. At the end of the Company Review Process, the Sponsor must release the document to The Open Group in an acceptable electronic format and execute a copyright transfer, according to the Standards Adoption Criteria. The Open Group is a Recognized PAS Submitter. This permits The Open Group to submit standards to ISO/IEC JTC 1 for adoption as International Standards. The criteria for selection of a candidate standard for submission as an ISO PAS and the process for approval of the submission are documented in this section. Where, as part of the adoption process by ISO/IEC JTC 1, changes are identified to The Open Group Standard that has been submitted, they will have to be approved through the Company Review Process. The Open Group is a Recognized PAS Submitter to ISO/IEC JTC 1. This section documents the criteria required for a standard to be a candidate for a PAS Submission. The document must be an approved standard of The Open Group. The Sponsor must prepare the draft proposal to submit The Open Group Standard as a PAS. This includes completion of the PAS Submission form from ISO/IEC JTC1. The Sponsor must provide for resources, usually in the form of a nominated individual, to attend the appropriate JTC1 meetings and represent The Open Group. The Sponsor must provide for resources to prepare responses to comments received in the PAS ballot, and resources to facilitate ballot resolution meetings. The Sponsor will be required to confirm its commitment in writing to The Open Group. Upon completion of a proposal by the Sponsor, the submission must first be approved by The Open Group Manager responsible for the technical area, The Open Group Director, Standards, and The Open Group Executive Management. The Open Group Director, Standards shall then notify The Open Group Governing Board via The Open Group Legal Counsel by email. This will include a resolution to approve the proposed submission and the appointment of a delegate to represent The Open Group at ISO/IEC JTC1 for the purpose of managing the technical approvals process within ISO. The Open Group Governing Board is responsible for approving the submission of a standard of The Open Group as a PAS Submission to ISO/IEC JTC1, and for approving The Open Group Liaison Representative to ISO/IEC for the submission. From time to time errors or inconsistencies will be found in The Open Group Standards; for example, as a result of interpretations raised in a Certification Program, or defect reports against the standard. These can be corrected through production of a Technical Corrigendum, detailing a list of corrections to the standard. A Technical Corrigendum against an approved standard changes the normative meaning of the standard upon its approval and thus must be developed through the Company Review Process. Once approved, the Technical Corrigendum will be made available on The Open Group website. Documents submitted for Company Review and intended to become standards will be reviewed and approved by the Vice President responsible for the work area, and the Director of Standards prior to entering Company Review. This process is also applied to documents to be released under the Snapshot Process. The announcement of the review will also be circulated to all Forum Directors1. This review will be coordinated by the Technical Editor passing the final draft of the document for review and approval prior to the announcement of a Company Review. For a document being released under the Snapshot process, this review will occur prior to submission for review by The Open Group Executive Management. Insufficient, erroneous or low-quality content in required sections (e.g., failing to mention MDA or the ArchiMate language in a proposed standard that is described in its title as modeling, or failing to reference a relevant ISO standard). Footnote 1:See the Standards Process Wiki for implementation details.